This versatile card is ideal to give to that 'someone special' at Valentines Day. It could also be given to celebrate a birthday, mothers day or a wedding day. This card has been stitched in red and gold but it could be stitched in any colour of your choice. 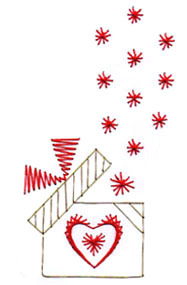 This pricking pattern comes with easy to follow step-by-step instructions and colour diagram. The pattern is delivered to your email address as a PDF file for you to download.